M5Xi Military 3-15x50 is rated 4.8 out of 5 by 13. Rated 5 out of 5 by Texas Cowboy from Get one! I have the Steiner M5XI 3-15x50 with H59 on a Tikka TAC A1 in 308, and what a perfect combination it is! The 3-15 has a lighter weight and the balance point allows free hand shots at game. I use the gun for hog hunting and for general target practice, nothing does a better job. The eye relief, light gathering, clarity and rock sold feel of scope is unmatched by any. The H59 is a bit fine on lower settings, but over 8x it is perfect. The illumination is unbelievable! Steiner being in the Beretta group is an asset in my mind as I have already received great customer support. Adding a Steiner scope to any rifle is the easiest way to upgrade your performance. Rated 5 out of 5 by EGAthUSMC from Without question! Just back from the range for zeroing. Mounted the T5Xi 3-15x50mm on a railed SAR8 Greek G3 on Badger Ordnance rings. Accounted for over bore mount 7 mils for 16 mils of elevation adjustment which will get my load out to 1,500m on a good day and more than i'll ever need. Only zeroed to 100m today but all was well. Easy zero. First shot in the black at 25m low and slightly right. At 100m adjusted .5 mils up. .5 mils left; bulls eye. Simple Simon. Great features on this optic. Plenty of adjustment, you cannot get lost in your dope with this turret; zero stop tops it off. All useful features. Of course the glass is very easy on the eye. No fatigue while shooting, no straining with a reticule focus and parallax adjustment. Makes shooting a breeze. Love the precision SCR reticule. The illumination in a little too dim even on a cloudy day, but works fine in low light situations. Overall a great optic in the mid price range with better features and at least equal quality than the competitors. Rated 5 out of 5 by Hollism27 from Own two Steiner scopes 3-15x and 5-25x I absolutely love my two Steiner scopes. The perform flawlessly. They are so clear I'm planning to replace all the scopes on my guns with Steiner scopes! Rated 5 out of 5 by Jwk17 from Exceptional quality and clarity This review is for the Steiner Military M5Xi 3-15x50mm. I have to say this is just exceptional build quality and clarity. I have this optic on a Knights SR-25 APC rifle and the thing is a tack driver. The MSR reticle is hands down the top 3 reticles out there. It is simple, yet has all the features you need. I needed a lower power variable optic with enough magnification to reach out and touch. 10 mil turrets, .1 mil adjustments, zero stop, and illuminated reticle were all must haves on the list. I narrowed it down to a very few select optics and went with the M5Xi. I would say that this optic does not disappoint. The eye relief is forgiving, and it is just simple to use. The zero stop is simple to adjust with the allen and the scope tracks very well. Scope mounts nicely in a KAC 19moa mount and I have not run out of adjustment out past 1000 yards. If you are looking for a serious use, clear as can be, bomb proof, 3-15 optic with an insane amount of features including one of the best reticles out there.... you found your optic right here.. The M5Xi. Done and Done. Rated 5 out of 5 by Rayza from World Class Quality, Ruggedness, Tracks Perfectly I bought my M5Xi Military 3-15x50 about a year ago. I wanted to put it through the ringer before writing a review so I could be honest about the results and I have to say, Steiner did not disappoint. I shoot out to 1000 Yards with it and it's always dead on. I love the solid clicks on the Elevation and Windage Turrets because they allow me to make adjustments without having to take my eyes off the target. I can feel and hear them. I also love that the 2nd rotation on the Elevation turret is hidden until it's used so I never get lost in the number of rotations. The clarity of the Glass is Top of the Line. The illumination is perfect and adjustable based on lighting conditions, and has off clicks in between each setting so you only need to move it one click once you've found a setting you like. The field of view is amazing. Eye relief is awesome. And the thing is a built to last through the toughest battles. It weighs about 2 lbs. and I'm certain I could remove it, use it as a hammer or mace, re-install it and it'd still work flawlessly. I was looking into USO and S&B but took a chance on this when I heard all of the reviews and I am so glad I went with this one. I love everything about it. FFP, Mil-Mil Adjustments, G2B Mil-Dot Reticle, Easy to Use, 34mm tube! Well worth every penny, and I'd recommend it for anyone looking for a top notch FFP 3-15. Rated 5 out of 5 by Billdub from Great Scope!! Mounted this on an LWRC IC SPR with a LaRue mount. Sub MOA at 100yrds. Easy sight in, the parallax adjustment gives more than enough to get a great sight picture. Can't wait to hit up the 200 yard range soon. I would recommend this scope. I would also buy another Steiner. I'll give Steiner first look next time I'm looking at optics. Rated 5 out of 5 by alekaras5811 from Best scope I ever owned, seen, or heard off. This probably the only scope I will ever own or perhaps in the future get an upgraded one if that is possible. The glass is simply amazing and the clarity of the optics is simply phenomenal. This scope has so many features I have a hard time remembering everything. It has a 34mm tube, 50mm objective, mil-dot reticle and 1/10 adjustments so you do not have to convert MIL's to MOA for adjustments. It is 3x-12x as well as front focal point so I do not have to set it on a set power to use the reticule. It is illuminated and uses a CR2450 battery which is commercially available everywhere which is also nice. The Illuminator is co-located on the parallax adjustment knob so there is no unsightly 4th knob which in my opinion gives the scope a more streamlined look. The whole thing is set up in the most user friendly manner and its intuitive on how to use. If I had a negative thing to say which I don't, would be that it is robust and some might say heavy. It's a trade of for the user who wants a great scope that is not flimsy. 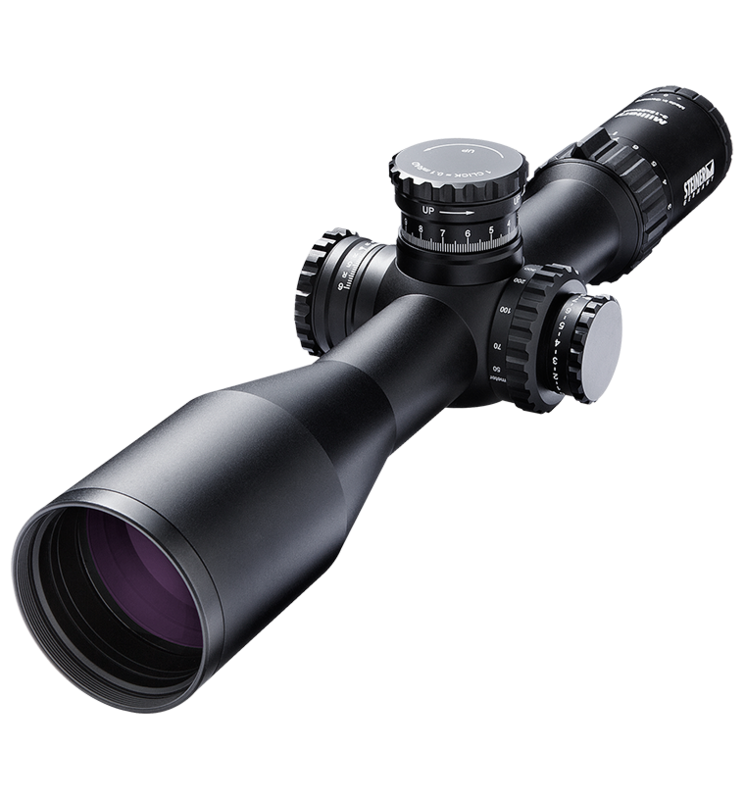 Rated 5 out of 5 by wetncold from Mine is the 4-16X50 This scope fills my need for a good long range optic. My criteria is first focal plane, mil/mil and at least 50mm objective. This scope has it all plus illuminated crosshair. When you pick up this scope you can feel the quality. The view is excellent with no blurred edges even at 16X. Just a point: Get rings or a mount with at least 40 moa cant to be able to utilize the most elevation adjustment for those over 1,000 yard shots. I read on the T5Xi page that the Horus 58 reticle was available on the M5 line, but it's not listed on this page as an option. &nbsp;Is that still true? The Horus reticle version of the M5 has not yet been released. Are any or all of these scopes FFP? I recently purchased the M5Xi 3-15x50 rifle scope and have some service questions but every time I call the service number in Colorado, USA I get put in a phone loop that no one ever answers. Is there a better way to reach service? Will Steiner ever make the M5Xi scope with a 'fixed power' setting? Many people would like to see a 10x42 or 10x50 'fixed power' scope with all the same features that the M5Xi comes with. The glass, the turrets, everything! Just a thought. It is doubtful given the current market and its forecast direction (why limit yourself to fixed power when fantastic performance can be had out of variable power?) but, we do keep notes on customer requests to assist in developing new products. Is steiner going to offer any MOA reticles? Not in the M5Xi line, at least for now. We will offer it in the T5Xi line at some point. I need scope rings to mount the M5Xi3-15x50 scope on a barrett M82-A1 50 cal rifle. For that we would recommend Extra High T-Series rings. How much does the optic weigh?? Maybe I missed it, but you'd think that such important information would be clearly provided in the specifications or in the description? 32.5 oz. Weight, along with other important specifications, are listed under the 'Specifications' section. I current have a M5xi 3-15 cope with G2B mil dot reticle. Just want to know can I send it back to change a MSR reticle one it? Unfortunately, Steiner does not offer reticle upgrades at this time.